What Expecting Mothers Can Expect from Their Insurance - Shannon Insurance Agency, Inc.
Discovering that you’re going to be a parent can be the most exciting news you’ll receive in a lifetime! But underneath all that joy and excitement is another emotion just as strong: fear. There is a ton of responsibility that comes with bringing your child into the world and you want to make sure you are doing it the right way. Even though your baby won’t arrive for another nine months, planning ahead is imperative. A great starting point to be sure that you and your bundle of joy are taken care of is by letting your insurance company know the amazing news. When you do, you should expect the following areas to be covered through your insurance plan. For many parents, it feels as though over half of the pregnancy is spent constantly visiting the doctor’s office while the other small part is the actual birth. However, every visit is important and results in news about your baby’s development. Gender revealing ultrasounds, glucose testing, multiple screenings, and hearing your baby’s heartbeat are all included in your visits. As the trimesters continue, you will even see your doctor more frequently to track and make sure your baby remains healthy. Typically visits happen every two weeks, but once the baby reaches a certain size, you will instead start showing up weekly. That’s a lot of visits! Make sure you have an insurance plan that covers all of them. 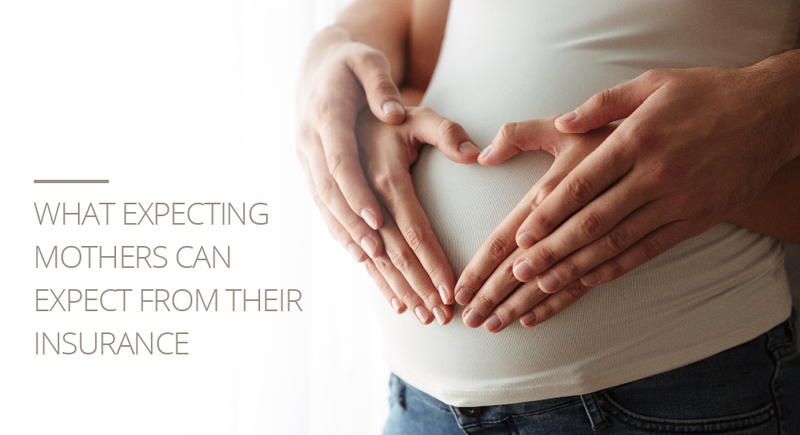 Without a doubt, the most important part of your health insurance is to make sure the delivery of your baby is covered. No matter how you give birth–natural, cesarean section, water birth or otherwise–this will be very costly if you are not taken care of financially. And it isn’t just the birth that will rack up the bill; room and board also comes with a price along with your meals, medication, and more. Luckily, with the right coverage plan, you won’t have to worry and can instead focus on bonding with your newborn child. Many have said that time stands still when their child is born, but unfortunately, it cannot remain that way. Once they are welcomed into the world, they immediately have to undergo several tests that weren’t possible when they were in the womb. This is all to make sure that your baby is healthy and ready to go home. Screenings include testing for congenital hypothyroidism, hearing problems, phenylketonuria (PKU), and sickle cell anemia. Although these screenings, as stated before, do help ensure your baby’s health, they are not going to be free. At least not without insurance. If you are unsure about whether or not this is included in your plan, make sure you have a conversation with your agent as soon as possible. Delivering a baby is by no means a simple task. It can take a serious toll on you both physically and emotionally. As a new parent, you will need a lot of rest to combat the unbelievable amount of exhaustion you will feel. However, having a crying newborn baby in the room may not help in this situation, regardless of how badly you want to see them. Nurses offer to take your child back to the nursery to tend to them throughout the night while you catch up on your much needed sleep. Luckily, newborn care is also covered through health insurance. For mothers who choose to breastfeed their baby, lactation counseling is available at the hospital to teach new mothers how to perform the task properly. Many see this as a great benefit, especially since it is one of the first of many bonding moments between mother and child. Even after the mother has left the hospital, breast pump rentals are made available to help you further and, as you may have guessed, are covered under your health insurance. As soon as your baby is brought into this world, you want to be sure to inform your insurance agency so that your son or daughter can be added onto your current plan. This way, they will continue to be covered throughout the rest of their life. To get started on the right insurance plan, give us a call at today and let us insure all your major life moments.